Banjoïste Country US née 7 Août 1962 à Hartford (Connecticut). Progressive bluegrass banjoist Alison Brown made her name not only as a virtuosic instrumentalist, but as an accomplished, jazz-influenced composer, a combination that earned plenty of comparisons to Béla Fleck and David Grisman. 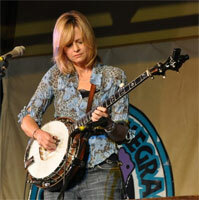 Brown began playing the banjo before reaching her teens and developed quickly, winning numerous contests and even getting a chance to perform at the Grand Ole Opry. She was also an excellent student, and temporarily left music to attend Harvard University; following graduation, she worked as an investment banker for a couple of years, but quit to pursue music. Brown gained her first wide exposure as a member of Alison Krauss' Union Station, covering the banjo slot from Krauss' 1987 debut album through 1990. That year, she departed to record her own debut, the entirely instrumental Simple Pleasures, for Vanguard, and also spent some time as the musical director for folkie Michelle Shocked. Brown's 1992 follow-up, Twilight Motel, was jazzier and more eclectic, and 1994's Look Left displayed her increasing interest in world and ethnic music. 1996's The Alison Brown Quartet refocused on her jazz sensibility and found her switching to guitar on a few tracks; it was also her last album before moving to the Compass imprint, for which she debuted in 1998 with Out of the Blue. 2000's Fair Weather featured a duo with Béla Fleck on "Leaving Cottondale," which won Brown a Grammy for Best Country Instrumental. Her follow-up album, Replay, was another of her jazzier outings. Brown sang about parenthood and musicianship on Stolen Moments, which arrived in spring 2005. She released Evergreen, a collection of holiday music with Joe Craven in 2007, followed by Company You Keep in 2009.